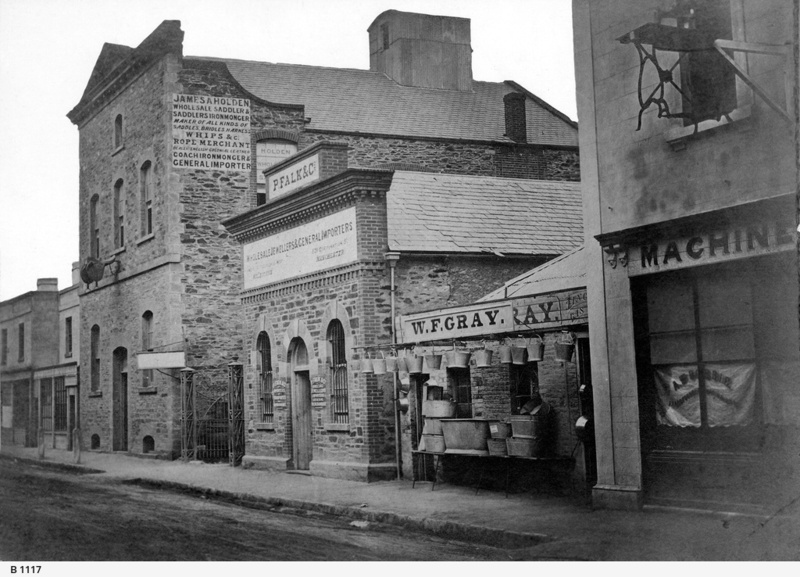 [General description] Gawler Place, Adelaide, west side, 1865-1873, showing the premises of James A. Holden, wholesale saddler, P. Falk, wholesale jeweller, and W. F. Gray, tinsmith (?) A saddle is hung above the entrance of the saddlers', and the machine shop on the left has a sewing machine mounted above its door. W.F. Gray displays its wares in front of its store; buckets hanging in a row, and various sized tubs. The stone buildings in the centre have shingle roofs. J.A. Holden & Co. is the original firm later to become Holden and Frost, (see B 2989) and then General Motors Holden. A better reproduction is preserved in the pictorial preservation collection; this can be retrieved for inspection upon request.